I wanted to keep writing but somehow did not continue doing(mainly due to laziness), I am planning to restart the blog writing by last quoting some of the interesting blogs that I read during the week. Got introduce to Twitter very recently and only today I checked what it was. The main goal of twitter as they say on their website, is to easily keep contact with close friends. But for me Twitter has a completely different use. I have decided to use twitter to update my daily activities and see how I can get more productive. It is a tool that have using for managing my scientific reference papers. It is one of the best tools for that I have used so far. I have been using it for the last two months, still learning its features but I am really excited about the tool. I don’t have to print the paper and highlight the important points, file it away in the cabins and then start searching for it later. Oh what a relief !!. Thanks to the great folks of George Mason University’s Center for History and New Media for having produced such a software. But the sad thing is that I need to maintain the same set of files on both my laptop and desktop as the reference material is stored in the hard disk. I cannot directly one from the other :(. But there are several new features being added to zotero to make it more powerful, so I am sure this will be taken into account. All in all I feel Zotero is an essential tool for anyone doing research online. Error bars are almost shown in most of graphs used in research papers. In my experience not many of us give much importance to the error bars, questions about it only come from the group leader or the bosses. In several papers, the figure legends never describe kind of error bars used. Even in my statistics classes in biology the importance of error bars and their interpretation was never explained. Came across this nice paper in Journal of Cell Biology explaining usage of error bars in experimental biology. 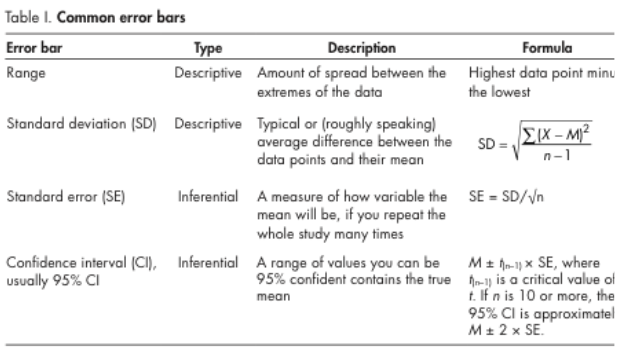 They explain the different types of error bars used for descriptive and inferential statistics. The formulas are well explained and illustrated with good biological examples. The transcription or the expression of a gene(the process by which the DNA sequence is converted into a functional product like protein or RNA) is controlled by the region of the DNA generally present upstream of the gene. This region consists of several short segments(also known as motifs) which act as binding sites to proteins called transcription factors. It is generally believed that genes that share the same multiple regulators must show similar expression profiles or vice versa the genes that are show close expression patterns could be regulated by the same set of transcription factors. If we look closer at the regulatory regions of a known set of co-expressed genes in a particular tissue, will it give a rule for how the architecture(the min or maximum number of binding sites, spacing of these binding sites, orientation of these binding sites etc.) of such regulatory regions look like and explain something about their evolution ? This is exactly what the authors have done in this paper in science(subscription required). They have used the 19 genes that are co-expressed in muscle cells of developing urochordate Ciona embryo. Of these 19 genes, 17 function in the same macromolecular complex, underscoring the requirement for tight coexpression. These 19 genes include six single-copy loci (sequences in a genome that do not share homology with any other sequences in the same genome). Seven genes are composed of two or three members(paralogs) of multicopy gene families. We also know that genes that are expressed in Ciona are predominantly regulated by three different binding elements in their regulatory regions. These elements are 1) cAMP response element called CRE 2)MyoD motif 3) Tbx6 motif. These elements can be described in terms of DNA sequence bases they are composed of. The authors study the distribution, composition and strength of these motifs in the upstream regulatory regions of the 19 genes. They found that there was high degree of heterogenity in these regulatory genes. There was no common feature they could discern from all of these 19 loci. So how to account for the co-exp of these genes, the authors show that it is done by conserving locus specific distribution of these features. This can be see more clearly in the following picture (B). (B) Distribution of cis-regulatory function at the 19 loci of this study. Cs, Ciona. savignyi; Ci, Ciona. intestinalis. Labels below axes indicate distance to transcription start site. Area of circle is proportional to estimated motif activity. Motifs are depicted as circles, and color indicates motif type: CRE (red), MyoD (green), and Tbx6 (blue). We do not see any commonality in the locus, but we see that the architecture of the regulatory regions are conserved in the specific locus, for example the Ck.ci(creatine kinase gene from Ciona intesinalis) and Ck.cs (from Ciona savignyi) have the same distribution of the motifs. This locus specific conservation the authors saw only in the six single copy genes. There was a higher degree of heterogenity in the paralogous cluster of genes in terms of both sequence and functional turn over. I learnt about epistasis in twelfth year of schooling. It was first used by Bateson to describe the masking of one allele(variant of a gene) at a locus masking another allele at a different locus. But today I see this word used in different contexts and I was really confused about its meaning, so looked on the net to find this paper describe wonderfully what I was looking for. I found a nice detailed animation describing the PCR reaction.